Must they be called that? Geez. I plucked a package from the display rack and quickly slid my thumb over the words Girdle Top, while hunching my shoulders around the cardboard package. The g-word made me cringe. I couldn’t believe I’d gotten myself in this position. It brought back a vision of my grandmother, a hardy, thick-waisted woman who expended considerable effort donning a girdle – the kind with dangling metal clips that attached to thigh-high nylons. The fact of the matter was I needed a word like girdle. It was unapologetic and assertive. I had no time to waste on sugar-coated euphemisms. They’d just create doubt. I needed a guarantee. I had three hours to lose twenty pounds. These pantyhose were my last hope. I guessed on the size, made the purchase and ran to my car to get home. I had to dress fast and be back out the door in a hurry. When I removed the pantyhose from the package, they cascaded to the floor. Then down the hall. They were at least 8 feet long−no exaggeration. The girdle part alone was 4 feet. A quick inspection of the package confirmed I’d bought the correct size and there was no sign of the word “irregular” anywhere. If I wasn’t late, and panicked that my dress wouldn’t fit, I’d have a real belly laugh over these. Clearly, they were designed for a bloated Yao Ming. Let me clarify, while they were extra-long, they were not wide−by any stretch. Even a good yank at the waistline had me perspiring with fear that I’d never get one leg in, let alone 2 legs (with thighs) and a stomach. I sat down on the closed toilet seat and took a deep breath. This had to be done right the first time. Once these bad boys were on, I was pretty sure a pair of scissors would be the only way out. 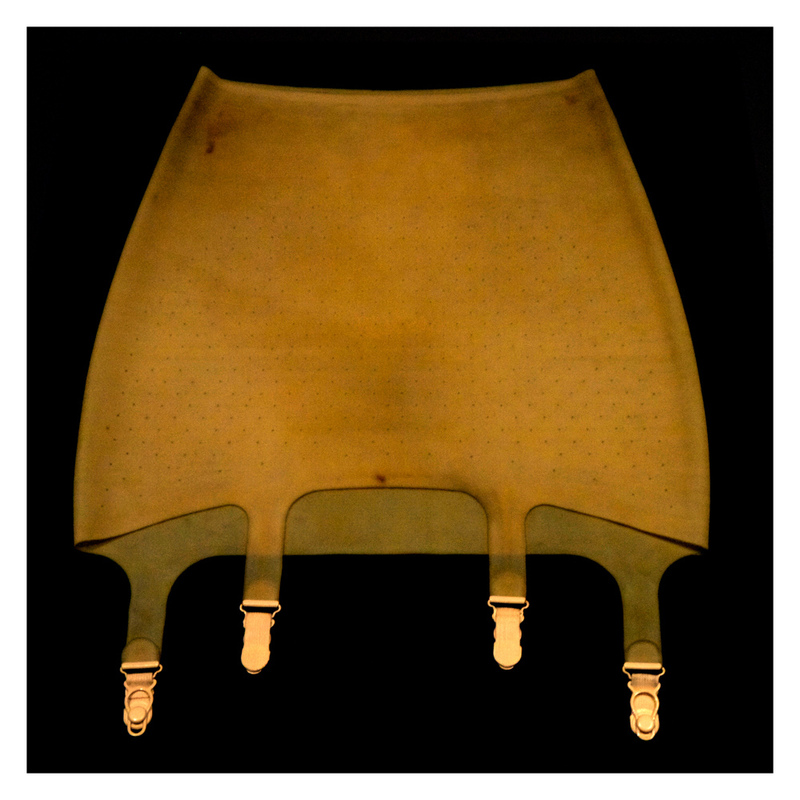 Perplexed by the four foot-long girdle, I examined the back of the package which demonstrated a silhouette wearing them. The waistline was not at her waist at all; it stopped right beneath her breasts. Hmmm? Could that mean that all the unwanted rolls of flesh below my waistline would be pushed and squeezed up to my breasts? That’s freaking brilliant! I started to feel tingly with anticipation. Of course, if that held true, these supernatural-nylons would need a new name, like tummy flattening-bust enhancing hosiery? No, not zippy enough. I’d work on that later. Right now it was time to concentrate. I won’t bore you with the details. There was a good deal of swearing, hopping, sweating, teetering and yanking. It was a blessed miracle that the girdle stretched enough to engulf my entire mid-section. I thought I might like the new svelte me, but pain obscured any joy. I began to feel tingly again, now, lack of circulation. Even my breathing was hindered. Short breaths only. No time to pity myself, I was on a tight clock. I’d even have to surrender to the sagging crotch−two inches below its intended position. Short strides for rest of the day. I grabbed my dress off the bed and wiggled in. Out of the corner of my eye, I saw a spot on the back of my leg, in my knee pit. It was a small green splotch. Did I burst a blood vessel?!? No, it was a small boxwood leaf squashed against my leg. What the hell? No time for questions. I had to remove it. But not with a quick slip of the hand down the back, because there was no room! My hand, literally, could not weasel into the tight grip of the girdle! I had to lower the damn thing all the way to the knees to get that leaf out. This brought the crotch down even lower. Too bad. Had to go. I arrived at the restaurant and eased my way out of the car. Short steps, short breaths, flat stomach, full breasts. I walked up the path to the door, and noticed the faint smell of newly cut grass. I pinched my nose to ward off what I feared was imminent. Too late. Robust sneezes came fast and furious. The waistband was no match for the third sneeze; it curled in submission. The laws of gravity and physics assisted the curling momentum until my ample tummy sprang from its constraints and rippled over the top. It was free. I took my first deep breath in an hour. Nonplussed, I continued to inch my way to the door. Short steps, deep breaths, fat stomach, flat breasts. My new favorite post. Loved the pantyhose falling down the hall and that you thought maybe it would enhance your breasts (not that you need that or the girdle, for that matter!) Loved the boxwood leaf. Sorry but I am looking forward to your next fashion problem. You’re a good friend. I’ll let you know when that happens. This story brings forth the reverse of the old Irish Spring bar soap TV slogan. In response to this giggler, a man might say: “Womanly, yes, but I like it too.” My congrats to photog Rob Thurman for such an accurate girdle shot. Not that I ever wore one, but I’ve seen them on my mother. Oh I don’t know if he wore this girdle… but that’s entirely possible. I do love the photo. And I remember that Irish Spring commercial! I used to love Irish Spring, it’s the best smelling soap anywhere. Except of course, for Eau d’Italie from Le Sirenuse! you’re too funny. And I’m so jealous. I’ve been wearing the girdle to pantyhose for years. Previous Previous post: Do Fiction Writers have an Obligation to Society?